Aug. 4: Witnesses reported seeing a deer with a wire wrapped around its neck near the stairs by the Botany Pond. When officers arrived the deer was nowhere to be found. Aug. 4: Three dogs were reported to be locked in a car. When an officer arrived the car was found to be in shade, thus not endangering the dogs. Aug. 2: Police were called when a male student was reportedly having an inappropriate conversation with two female students at the BYU Bookstore. When police arrived, the three students were questioned and it was determined no laws had been violated. July 22: A truck with a female and four males was seen throwing eggs at cars on campus. The egging victims were contacted and none chose to press charges, so the egg-throwers were released with a warning. July 21: At 1 a.m., juveniles were reported to be jumping up and down on the gate arm at the south gate near lot 2. When police arrived it was clear the juveniles were simply doing the limbo using the gate arm and that no damage had been done to the arm. July 17: A male student was cited for being disruptive in the library. The man was snarling and threatening library staff, claiming that he had received unsatisfactory service. The man has a history of this type of behavior. July 15: Witnesses reported seeing two females and a male stealing laundry from the facilities at Wymount. The three were carrying laundry in a large black trash bag. It turned out the three were doing laundry for several family members who were visiting from out of town. 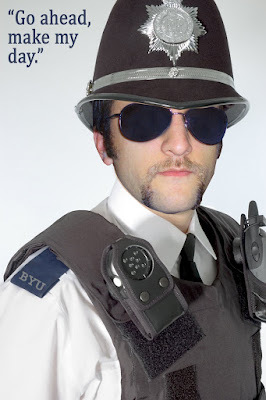 July 11: A 50-year-old male was arrested, cited and released for stealing $26 of products from the BYU Bookstore, including a triple combination, the Book of Jasher and a raspberry chocolate candy bar. The man has previous history of retail theft at BYU. June 30: Police followed up on a report of people being loud at 11:30 p.m. at Wymount Terrace. The loud people were asked to be quiet. June 3: An officer and a grounds employee rescued 11 ducklings from falling into a storm drain on the south side of the NCAA track. June 2: A blind deer was found by a resident at the Wymount Terrace. Provo Animal Control was called and they came and took care of the animal. They knew it was blind because it was running into things. June 1: Five students, males and females, were reported for riding their bikes inside of JFSB. They were warned and released. May 31: A student called and reported suspicious behavior at 11 p.m.. A car had been running around the law school parking lot for 30 minutes, police said. When the officer arrived the male explained he was teaching his girlfriend how to drive. May 27: Someone called in about a suspicious male in the WSC. The suspect had long, blonde hair and a goatee. It turned out he had lost his camera and came in to see if it was brought to the Lost & Found, police said. May 16: Someone called to report that the ducks and turtles were being stolen from the pond on the south end of campus. Police found that children were playing by the pond with the animals. May 14: At library closing time, a female student refused to leave the library. On May 11 she also refused to leave. The woman was given a citation and escorted out. May 13: The owner of a bike which had been impounded for parking illegally came to claim it, only to find that it had been stolen from the impound lot. I'm so glad we live in Logan. I think we're safer from all those BYU hooligans. I miss BYU!!! There's actually crime here in College Park. Just last week a girl got mugged at gunpoint at her front door. I'd take children stealing ducks and turtles any day. Boy, BYU is a magnet for really bad people... and some deer. Had I known all this, I might not have risked going out there for Education Week... I escaped, but barely. Is there really crime in Zion? You look like a combination of an English "bobbie", and one of Sheriff Joe Arpaio's nazis here in Phoenix.